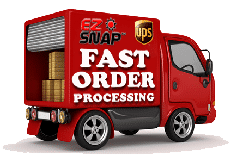 When you receive your EZ Snap product, if you are not satisfied for any reason, simply call our customer service department at 1-877-439-7627. We work hard to make sure all of our customers are satisfied. If we are unable to help you with your concern, and you still wish to return your order, you need to ship it pre-paid to EZ Snap using the shipping method of your choice. NOTE: If you have chosen to use your own fabric with our fasteners, there is no warranty. This is because EZ Snap Shade Mesh and RV Skirting Materials are specifically designed to perform well with our fasteners. We do not accept collect shipments. You will need to ship your product back to us pre-paid, in the same package it was delivered in, uncut, unused and clean. We will issue your refund within 6 weeks of your returned product arriving, less a twenty five percent restocking charge. It can take up to 6 weeks to know if any custom or brokerage fees were applied to your return, but if you follow to the instructions below regarding the “Declared Value” of your return shipment then you should be fine. Before returning any product, you need to request a Return Authorization Number (RMA#) from our Customer Service Department within 30 days of your purchase date. All Shipping and brokerage fees, duties and customs fees are the customer’s responsibility. IMPORTANT: Returns from addresses in the U.S.A. must indicate “RETURNED PRODUCT” and have a declared value of $5 dollars on the customs forms; otherwise, the return may trigger excessive customs fees or taxes that will be deducted from any refund. We offer a Limited Lifetime Warranty on EZ Snap® Shading Mesh and RV Skirting Material. *Please Note: You need to call for a Return Authorization Number before you return any product for warranty or replacement. Refer to return information above.